The best comic book covers strive for more than solely portraying characters and logos; they tell a story in one image. A few artists tackle this daunting task with relish—Dave Johnson, Brian Bolland, Matt Kindt, Will Eisner and Mike Del Mundo come to mind—and August sports an especially robust cross-section of eye candy that conveys twists, turns and conflicts in a panel. Dean Ormston’s cover to Black Hammer #2 offers a worm’s eye view of a towering pulp robot, instilling a sense of empathy (and wonder) at the tiny hero standing in brazen defiance. 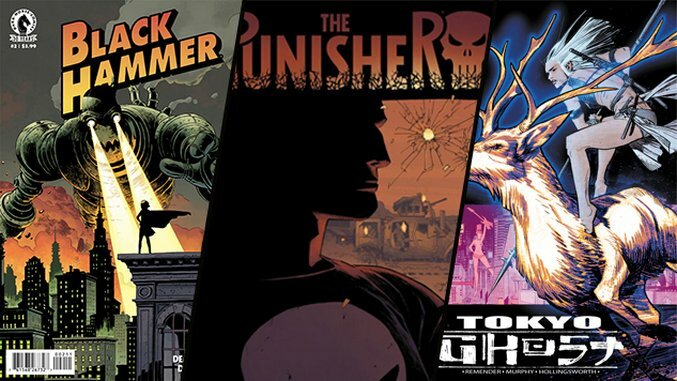 Declan Shalvey takes the opposite side of the same approach, focusing on the vigilante antihero, Punisher, in a zoomed foreground; the striking contrast of the bullet holes lead the eye backward to the hazy, threatening alarm of a DIY tank attempting to unleash hell. 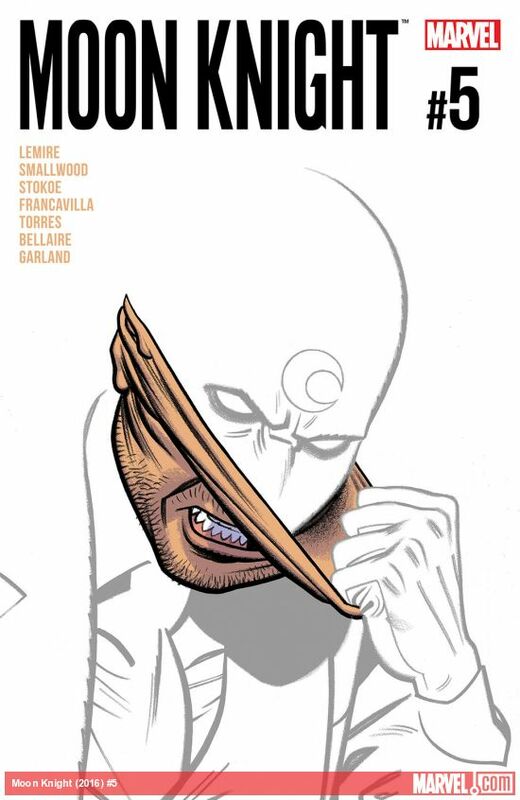 This strategy prioritizes message over ornamentation; check the impact of Greg Smallwood’s Moon Knight #5 cover. The sheer creativity of a hero visually stripping away his skin to reveal a masked identity would be obscured by a busy background or more detail. This concept—explored in entire story arcs of Batman, Superman and all manner of superhero comics—is synthesized in one bold, Cronenbergian image here. Listen closely to it and you can hear a mic drop. Other standout covers from this month include Sean Murphy’s glowing finale to Tokyo Ghost, Mike Allred’s tongue-in-cheek celebration of Marvel’s naked, cosmic extreme sports enthusiast and Paul Azaceta’s chilling cover to Outcast #20, aided in no small measure by colorist Elizabeth Breitwiser.